I am honored to write for Sarah's blog. To understand why my visit meant so much to me, I need to go back to September 11, 2003. That afternoon, I got my first e-mail from Sarah. She explained that she had found me through Steven Den Beste's USS Clueless blog and had been reading my blog since. She noticed that I had attacked Chomsky's linguistics as well as his politics, and asked me where I explained why I rejected Chomskyan linguistics. She had never met an anti-Chomskyan linguist before. And I had never met anyone like her before, though I didn't realize it at the time. We exchanged a few emails and I thought she was just another reader. I was so wrong. "tell your story to Den Beste or Instapundit. Bloggers are memetic warriors. We fight by spreading our ideas." She sent her tale to Den Beste, who published her tale that day. And then trying to grok debuted on Blogspot on October 6, 2003. I'm embarrassed to say I didn't know of TTG's existence until October 7 when Den Beste linked to it. So I've been here every day since day 2 - excluding days without Internet access. She linked to me on TTG for the first time in her second post. Me, being slow to recognize her greatness, didn't add her to my blogroll until the week of November 15-22. D'oh! "Congratulations on the success of your blog. Having Den Beste publicize it is the dream of a thousand other bloggers, but it came true for you!" Would you be reading TTG if not for Den Beste? Cause and effect chains fascinate me. I wanted to tell Sarah and her husband the full story behind that first encounter on 9/11/2003 in person. Some things can't be typed or IMed or even phoned. Don't worry, I didn't think my trip was all about meeee. Would a true egotist declare Sarah to be a fountain of knowledge - the meaning of her Tangut name? Although she was in Germany six years ago, I could feel her power in rural Hawaii. You feel that power too, or else you wouldn't be reading this. (Or you've stumbled on this and have no idea who we are. If so, go away!) I wanted to experience that power firsthand without any technology to dilute its intensity, to truly be with my idéamie (< idée + amie). I couldn't sleep the night before I left. I packed and shut off my laptop just twenty minutes before my shuttle van was scheduled to arrive. I was cutting it close, but by my standards that was pretty good. I've had to shut down after the van came. Not this time. I couldn't mess up my pilgrimage. However, it would turn out that there are more ways to err than I had ever imagined. I waited outside for the van, listening to instrumentals from Godzilla movies. What was I thinking? I wasn't about to be eaten by a Sarahsaurus! The van came a bit late. Fortunately, it didn't have anyone to pick up after me, so I got to the airport on time. I tried to sleep in the van and on the plane but I couldn't. Too much energy. I went into what I call power saver mode. Not moving, not seeing, just staying still and relaxing. I landed at the airport a little after 9. I was a bit disappointed as I didn't hear any Southern accents. And I wasn't playing my iPod! My senses were fully turned on as I realized I had forgotten what Sarah or her husband drove. I looked at every passing car, hoping in vain to see a familiar face. I went in and out of baggage claim, hoping to see them. And when I finally ran into them, the conversation we had was not meant to be preserved for the ages, or even five minutes. Take my word for it. What else could go wrong? Sarah had worn a shirt only she could have made, but I was too flustered to notice at first. I told her I'd be wearing a shirt with 水 (water) on it - that is so not my element, but it is the shirt I always wear when I depart by plane.. The Groks had parked at a different end of the airport. No big deal. That gave me more of a chance to walk beside them instead of just getting into a car right away. Sarah described how she made her one-of-a-kind shirt. There was no giant caption declaring, "THE FIRST MEETING OF SARAH AND AMRITAS!!" Or any orchestra blaring this fact for an oblivious audience. Ignoring the fact that I was carrying a laptop and a bag of clothes, I could have been talking to her as if we had always been Real World friends. I had seen photos of her and her husband innumerable times, so there were no physical surprises. I expected them to be taller than me. Nearly everyone is. I did not expect my pants to be caught on my bag as I was trying to place it in the back of the Groks' van. Strike two! What next? I couldn't think, but Sarah, calm and resourceful as always, disentangled me. 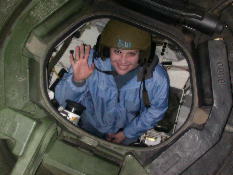 CPT Grok took the wheel as I sat diagonally across her in the back so she could see me easily from the passenger seat. Before I knew it, I was in what AWTM might call chip-cashing mode. I wonder what CPT Grok thought of me. He struck me as the strong, silent type, both in person as well as in Sarah's descriptions. I, on the other hand, am the weak, blabby type. (Almost typed "whiny" but I don't want to believe I'm that bad. I do not want to be a guest on Oprah!) And I regret not asking him much if anything at that early point. I wasn't comfortable with him yet. That would soon change. After about 90 minutes of nonstop talking that flew by like 90 seconds, we arrived at a castle I recognized. It was as pristine as a finely maintained museum - a shrine to the Groks. But no such institution would have a dog leaping up on me. Enter Charlie. Sarah explained that he'd be out of control around me at first but that he'd soon calm down. I didn't mind, which is odd for me since I'm normally not as ease with pets. Charlie's charm was irresistible and his presence is unforgettable. He is just as much a part of the Grok trinity as the two humans, who belong to a species distinct from the average Americans criticized by Un-Liberaled Woman. I used to say that humn (sic) was a four-letter word. I need another word to describe the Groks. It is rare for me to be with people like them whom I can fully relate to. I wore no mask. I said what was on my mind. I was free. And I was well-fed. Sarah had asked me what I wanted to eat for breakfast, lunch, and dinner and she and the Mr. delivered: sandwiches, meat loaf, pancakes, curry, hash browns, and bacon. If I had my grandfather's culinary skills - he was a chef - I should have reciprocated, but noooo, I just ate. No need for snacks. Grok meals were filling. Day one (Friday) was like one long conversation about language and culture with CPT Grok and I representing our respective regions. I felt as if there were nothing I could teach him, a man nine years younger than me, yet so much more wiser. He humored me and talked to me even without our common denominator present. We took breaks to use our computers. My machine, named Spinny because I see Windows Vista's busy icon spin and spin, was actually behaving for once. I got to show Sarah a digital art project in progress. I had wanted to finish it before I arrived, but it was a good thing I hadn't because I spotted some errors that I corrected on the spot. I hope to finish it before CPT Grok deploys. This report is two days late and that piece is months late. By 9 PM I was burned out and I slept for the first time in 36 hours. The day had gone by so quickly that I hadn't taken any pictures or notes! Day 2 began with me waking up at 7, going back to bed, then having Charlie wake me up. Best alarm ever! He then quickly left the room on his own and I lay in peace for another hour. After pancakes, a South Park episode I had never seen before, and some clips from a movie I'll discuss later, we were off to the local military museum for a talk by a former POW. Sarah already wrote what I wanted to write about that - but better, of course. I wish I had something to add. There was no linguistic angle since the POWs communicated to the Japanese through interpreters, and I assume their contact with the Chinese in Peking prior to their capture was minimal or even nonexistent. We three might have been the youngest members of a small audience. Wasn't anyone else even curious? At least those few who did come were respectful. I overheard a conversation between a woman in the audience and a video cameraman. They sounded so ... patriotic, which to me was exotic. This was a different world, one that I knew existed through the Internet. But now I was really here! I was able to share my world with the Groks and explain how it came to intersect with theirs. In the morning, I felt it would be a waste to have the DVD player on for only 20-odd minutes to play South Park, so I asked if I could play some scenes from The Super Inframan (1975). I showed it to the Groks as an example of the Japanese-style superhero action that got me interested in Japanese, which led to linguistics, a fellow Japanophile who introduced me to Ayn Rand, and anime/manga fan/US comics writer James Hudnall, who led me to blogging - and to Steven Den Beste who built the digital bridge between Sarah and me. No Kikaida, no Sarah. Day 3 was spent outside Castle Grok. Sarah dropped off her husband at work and showed me his post - and her workplace. I got to touch and photograph her creations. And I accompanied her in her quest for a cucumber at the PX. After picking up CPT Grok, we sought a Korean restaurant in vain. We didn't count on any of them being closed on a Sunday. Fortunately, we found a Thai-Vietnamese-Korean restaurant and each of us ordered a dish from one of the three countries. I had never had dinner with both Groks on the same side of the table across me before. They were quite a comedy duo. They weren't performing for me. They were just being themselves - and they were funny! Day 4 came before I knew it. I sat at their table for the last time to eat hash browns and bacon. Mmm. Then it was time for group photos, goodbye to Charlie, and a long drive to the airport. The conversation continued, but as the end approached, I feared I might cry. I didn't. Why would I? AWTM and I had talked the night before, and she told me not to say goodbye. This wasn't the end. I was - and am - determined to see Sarah again. Sarah, thanks for everything! I am eternally in your debt. You Groks are - as Michael Penn sang - no myth. Never despair. There are still good guys in this world. I know. I've met you. May your fountain of knowledge flow forever. Post contains 2085 words, total size 13 kb. 1 Sounds like Amritas had a wonderful time! 54kb generated in CPU 1.31, elapsed 1.2088 seconds. 49 queries taking 1.0563 seconds, 199 records returned.